I finally had a chance to try my hand out at making my own spring rolls and decided to have a wrap up day when the girls had their sushi rolling day. This would have been a great entry for Lasang Pinoy’s Binalot event, but things just didn’t synch up right and I missed the deadline. Like I said, I had been meaning to try making my own spring rolls at home ever since I saw other food bloggers doing such a great job with it. I’ve had the wrappers in my cupboard for months, but the thought of wrapping these things intimidated me, I don’t know why. I think it’s because one of the steps is to dunk the rice paper wrapping into warm water, and I was afraid that it would start falling apart on me. Well, I decided to take the plunge, and said a silent kitchen prayer. I found it wasn’t that bad at all! The wrappers are really quite resilient and forgiving even if you leave it in to soak a little longer that you meant to. All the sogginess eventually dries out as it sits and you get a chewy wrapping that absorbs just about any sauce you decide to use with it wonderfully. On the photo below, I simply laid the wrapper on the cutting board and started filling it. You see how wet it is. It gets a little messy and sticky doing it this way, so don’t. What I did with the rest of the rolls is to lay a clean kitchen towel on the cutting board and laid the wrappers on this instead. It worked out wonderfully because the towel absorbed the excess moisture, making the wrap a little less soggy. ChivesThai Sweet Chili Paste, for dippingHave all your ingredients ready and on hand before starting to ease the process. 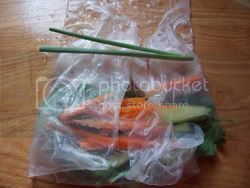 Put warm water in a bowl of water and submerge the rice paper wrapper, one at a time, to soften. The wrapper will soften almost immediately. Place the softened wrap on a clean kitchen towel and layer with the rest of the ingredients except the sauce. Place the lettuce first, the carrots, the cucumber, cilantro and basil. 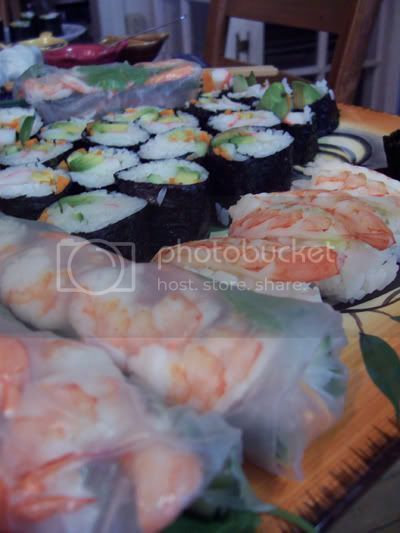 Then slightly below this pile (as shown on the photo above, line up your shrimps. Why do this? It’s just for looks, honey. 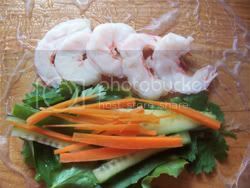 That’s so when you roll up your spring roll, the pretty pink of the shrimp will show through the translucent skin. Fold the sides over the center section and lay a piece of chive with the end sticking out. Again, just for looks 😉 Roll up your spring roll, and you’re ready to eat! The girls liked dipping it in the Sweet & Spicy Thai Chili sauce. 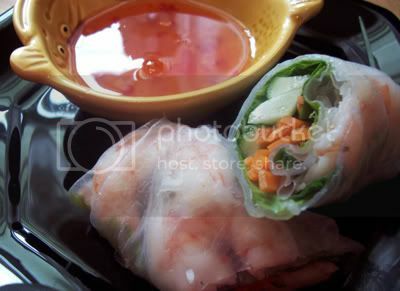 Are you wondering why we didn’t put the clear vermicelli noodles when every spring roll recipe you’ve seen includes it? Simple really, the girls don’t like the noodles on their spring rolls, which is one reason why we wanted to learn making this at home. Love the spring roll and everything in it…except for the vermicelli. Those look so lovely and fresh! Such a great way to have a get-together! I’ll have to check the brand on the wrapper, Stel. First time ko ring bumili ng ganyung type ng wrapper and couldn’t remember the brand, sorry. Check ko next time I go to the Asian market. Tita J! Finally, the new home is up, weee!! and finally (ulit-kulit!) ginamit mo na wrapper!! o di ba, sulit na sulit!! Actually I thought of you when I ordered a plate of this when I was in Thailand last week…ahahahayyy! nakakahimatay sa sarap, di ba? they look awesome tita J! they’re pretty and very see-thru, what brand did you use? haaay they’re making my tummy growl! i like those w/ a peanutty sawsawan. i think the noodles are like filler anyway. mas okay ang veggies.